Hi folks! I just got back to St. Louis from Carterville, IL. I spent all day at Tri-C Elementary talking with some pretty neat kids. I gave two big presentations – one for the older students and one for the younger ones, and then met with smaller groups for the rest of the day to answer questions. The students colored some awesome posters welcoming me to their school. This evening I got to speak with some parents as well. After my talk, we had punch and cookies and many of the students’ own books that they made were on display for the parents to see. It’s fabulous to see so many parents supporting their kids’ love of reading and writing! Thank you Tri-C Elementary! Happy St. Patrick’s Day! This morning I got to visit with the students at Bruce Elementary in Maplewood, MO. I was invited to speak with these awesome kids because they were working on book projects about their local community. 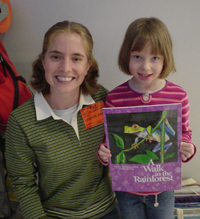 Students focused on different aspects of their community such as social issues, history, or ecology. So they could really relate to my journal books that focus on desert and pond communities. It was a fantastic day, except when the students asked questions at the end of the main presentation – I called on someone in the back and said “yes – you in the green!” That doesn’t work in a room full of kids celebrating St. Patrick’s Day – ALL the kids were wearing green! Ha ha. Thank you, Bruce Elementary! The last school I visited was Rockfield Elementary. 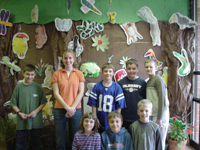 This is a picture of me with some 5th graders in their paper rainforest that they made. I had a super time with these students. They reminded me why I make books – so these guys can have fun reading them. Thanks, Rockfield! Today I visited Amy Belle School. This school was also decorated with some fabulous student artwork. Each class was very excited to show me which projects they made. One class made a diarama of nocturnal and diurnal animals from “Saguaro Moon: A Desert Journal.” There was a paper rainforest in the library, and a huge mural featuring all sorts of pond animals and plants from “Salamander Rain: A Lake & Pond Journal.” Like all the Germantown schools I visited this week, the teachers put together a tasty lunch with lots of homemade dishes. Thank you Amy Belle! Still in Germantown, Wisconsin! I spent the afternoon of the 2nd and all today at County Line Elementary, where the students prepared for my visit by painting huge posters of some of my book covers. It was a great day. I was even interviewed by two very professional 5th graders for the school newspaper. Thanks, County Line! Wow! I just got back from a week-long stay in Germantown, Wisconsin, where I spent 5 days visiting 4 different schools in the area. And I must say, I am totally impressed with how well prepared the students were for my visit. 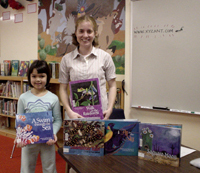 They did several awesome projects relating to all 5 of my books. The first school I visited was MacArthur School. What a great bunch of kids! The kindergarteners all did portraits of the visiting author and hung them up in the hall outside their classroom. Very adorable. The teachers also prepared a wonderful buffet lunch in the staff room. Everyone was so kind – I felt very welcome at this school. I spent all of Monday, and Tuesday morning at MAcArthur. And of course, as everyone in the elementary school world knows, March 2nd is the birthday of Dr. Seuss. In fact, this year is the Seuss-centennial. I was so mad that I forgot to bring my “green eggs & ham” t-shirt on this trip! But a wonderful teacher, Mrs. Weinhold, got me all dressed up for the occasion. 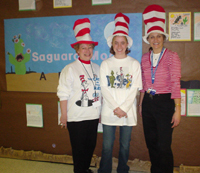 This is a picture of Mrs. Weinhold, me, and Mrs. Semmann all “seussified” for the occasion. Thank you, MacArthur School!